I specialize in the teaching of programming for the Computer Sciences program in the Faculty of Sciences, and I usually teach Computer Sciences Introduction and Data Structures. Lately, I have been sporadically teaching Modeling and Programming. I have also taught Analysys of Algorithms and Computer Architecture and Organization. Computer Sciences Seminar B: This seminar covers Combinatorial Optimization Heuristics. I am also involved with the Institutional Tutoring Program in the Faculty of Sciences, and I collaborate with the Propedeutic Courses for first year students of the Computer Science program. Canek Peláez, Elecciones La ciencia al servicio de la democracia, ¿Cómo ves?, year 20, number 235, June 2018, National Autonomous University of Mexico. 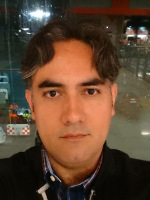 Canek Peláez, David Romero, A model and an algorithm to construct Mexican district maps, Book of Abstracts of XLVII Annual Meeting Italian Operations Research Society, September 2017, Page 141. Canek Peláez, David Romero, Advances on a Combinatorial Optimization Approach for Political Districting in Mexico, Actas de la XVII Conferencia de la Asociación Española para la Inteligencia Artificial, Aquilafuente 224, September 2016, Pages 399-408. Canek Peláez, Unit testing as a teaching tool in higher education, SHS Web of Conferences, Volume 26, January 2016, ERPA International Congresses on Education 2015 (ERPA 2015). José Miguel Díaz-Báñez, Marco A. Heredia, Canek Peláez, J. Antoni Sellarès, Jorge Urrutia, Inmaculada Ventura, Convex blocking and partial orders on the plane, Computational Geometry, Volume 51, January 2016, Pages 55–66. Canek Peláez, Adriana Ramírez-Vigueras, Jorge Urrutia, Triangulations with many points of even degree, Proceedings of the 22nd Canadian Conference on Computational Geometry–CCCG, 2010, Pages 103–106. Elisa Viso, Canek Peláez, Introducción a las Ciencias de la Computación con Java, 2012, 573 pages, ISBN: 978-607-02-3345-6. Canek Peláez, Elisa Viso, Introducción a las Ciencias de la Computación: Manual de prácticas, 2008, 214 pages, ISBN: 978-970-32-5416-3. However, if it is possible to implement a computer program that solves or helps to solve a problem, I probably will be interested. Specially if the problem is NP-Complete or NP-Hard, and it has real world applications. If you have such a problem, and need a highly qualified programmer that understands discrete mathematics, do not hesitate to contact me. VI Congreso de la Sociedad Mexicana de Investigación de Operaciones, October 2017, Guadalajara, Jalisco. International Conference on Optimization and Decision Science (ODS2017), September 2017, Sorrento, Italy. XXVII Congreso Nacional de Estudios Electorales, November 2016, Guanajuato, Mexico. XI Congreso Español de Metaheurísticas, Algoritmos Evolutivos y Bioinspirados (MAEB 2016), September 2016, Salamanca, Spain. XXXI Coloquio Víctor Neumann-Lara de Teoría de las Gráficas, Combinatoria y sus Aplicaciones, February-March 2016, Querétaro, Mexico. Combinatoria y Matemáticas Aplicadas: una celebración de los primeros 70 años de Gilberto Calvillo y David Romero, November 2015, Guanajuato, Mexico. ERPA International Congresses on Education 2015, June 2015, Athens, Greece. Mexican Conference on Discrete Mathematics and Computational Geometry, November 2013, Oaxaca, Mexico. XXVII Coloquio Víctor Neumann-Lara de Teoría de las Gráficas, Combinatoria y sus Aplicaciones, March 2012, Tlaxcala, Mexico. XXVI Coloquio Víctor Neumann-Lara de Teoría de las Gráficas, Combinatoria y sus Aplicaciones, March 2011, Hidalgo, Mexico. XIV Spanish Meeting on Computational Geometry, June 2011, Alcalá de Henares, Spain. Canadian Conference on Computational Geometry 2011, August 2011, Toronto, Canada. Canadian Conference on Computational Geometry 2010, August 2010, Winnipeg, Canada. XXV Coloquio Víctor Neumann-Lara de Teoría de las Gráficas, Combinatoria y sus Aplicaciones, March 2010, Querétaro, Mexico. XXII Coloquio Víctor Neumann-Lara de Teoría de las Gráficas, Combinatoria y sus Aplicaciones, March 2007, Guanajuato, Mexico. Before starting my tenure-track, and although I have never really stopped teaching since 1998, most of my jobs were as professional programmer. My GitHub profile. Some small personal Free Software projects I maintain at GitHub. My personal GitLab instance. Same as above, but under my control. Most of the international traveling I have done in my life has been related to Academia. I usually take lots of photographs, and sometimes I upload them to my online album. 2011: Research visit to California State University, Northridge. 2011: Research visit to the Fields Institute; part 1, 2, 3, 4, 5, 6, and 7. 2011: Research visit to TU Delft; part 1, 2, and 3. 2011: Research visit to Universitat Politècnica de Catalunya; part 1 and 2. 2011: Research visit to Universidad de Sevilla; part 1 and 2. 2011: Bled'11 - 7th Slovenian International Conference on Graph Theory; part 1, 2, and 3. 2010: Research visit to Universitat Politècnica de Catalunya; part 1, 2, and 3. 2009: Research visit to California State University, Northridge. 2009: DocCourse in Bellaterra; part 1, 2, and 3. 2007: Research visit to California State University, Northridge. Blog. It has almost nothing to do with my academic life. It is written in Spanish. Online album. It has some pretty pictures. My Google+ profile. It has even less to do with my academic life.